GATLINBURG, Tennessee, March 20, 2012 (ENS) – The National Park Service announced today that white-nose syndrome, an emergent infectious disease that has killed nearly seven million bats in North America, has been confirmed in two of its most popular parks – Acadia National Park in Maine and Great Smoky Mountains National Park in Tennessee and North Carolina. Together these two parks host more than 11 million visitors each year who come to view the diverse wildlife and natural beauty of some of America’s most intact natural landscapes. White-nose syndrome has been documented at other national parks, including Delaware Water Gap National Recreation Area in New Jersey and Russell Cave National Monument in Alabama, where the disease was confirmed just last week. “Discovery of white-nose syndrome at two of our leading national parks is particularly troubling because of the vital role these parks play in safeguarding wildlife and plant populations,” said Mollie Matteson, a bat specialist at the nonprofit Center for Biological Diversity. White-nose syndrome is a disease caused by the fungus Geomyces destructans and is responsible thus far for the deaths of over 5.5 million bats in eastern North America. First discovered in a New York cave in February 2006, the fungus has spread rapidly – having been detected west into Oklahoma, north into Canada, and south to North Carolina. The fungus thrives in cold and humid conditions typical of those found in caves and mines in which many bat species hibernate. The disease got its name from the white fungal growth which can be seen around the muzzles, ears, and wing membranes of affected bats, typically during their hibernation. The U.S. 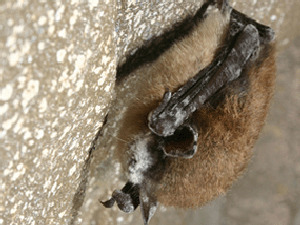 Fish and Wildlife Service also announced today that white-nose syndrome has been found in five new counties in Indiana, where the malady was first discovered last year, and two new counties in Pennsylvania, where bat colonies across the state have been devastated after the syndrome was initially found there in the winter of 2008-2009. Earlier this winter, federal officials estimated that nearly seven million bats have died so far from the fast-spreading fungal disease. White-nose syndrome is now confirmed in 17 states and suspected in another three states. It is also confirmed in four Canadian provinces. The Indiana bat is a federally listed endangered species, and has declined by 70 percent in the northeastern portion of its range. White-nose syndrome first arrived in the Midwest last winter, and has been showing up in numerous new counties in Ohio, Kentucky and Indiana this year. Six species of bat have been lethally affected by white-nose syndrome to date. Another three species, including the federally endangered gray bat, have been documented with the white-nose fungus on them. Biologists are deeply concerned that the bat disease may soon show up in the American West; the fungus was found on a nonsymptomatic bat in a cave in western Oklahoma in 2010.